For this blog, I decided to give my visitors yet another theme to choose from: the Dairy theme. This theme is coded with the latest HTML5 and CSS3 standards, and thus it is best viewed with the latest browser versions. Same as the other 3 themes available for this blog, the Dairy theme has been extensively customized, modified, enhanced with new features and functionality, and fixed to fit this blog. As for the Dairy theme, I spent 33+ hours over a period of 8 days, for all the customization needed. As always the theme is continuously open for improvements, fixes and new features. 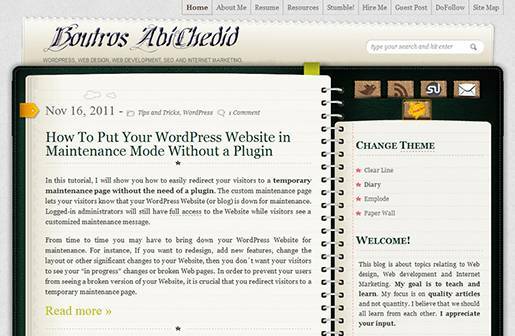 Now this blog´s visitors have the option to switch between 4 themes. As I discussed in my previous tutorial, cookies must be enabled in your browser for the theme switching to work. All these 4 themes, are becoming my WordPress testing ground, my WordPress design ground, my WordPress learning ground, my WordPress code playground if you wish. Create a unique look for your WordPress Website. It separates the presentation styles from the Core wordPress system files. It allows for quick changes of the visual design and layout of a WordPress Website. Modified the Theme´s layout by increasing the width of the background images from 922px to 1020px. Optimized all background images for faster load time. Extensive CSS (style.css) modifications and additions. Added Google Analytics code to the footer (footer.php). Added Advertisements code to posts (single.php). functions.php: Added many custom coding that are already available for the other 3 themes. For example, added functions to activate maintenance mode, to remove WordPress version, to make comment links as doFollow, to add the author bio for every post, and to add breadcrumbs trail and others. Added styling for all the above functions as needed in style.css file. Added the blog´s Logo as an image to the header.php file. Fixed the “Monthly Archive” Widget. Added the “blockquote tag” styling. Added the Comment pagination code (previous and next) to the comments.php file. This code was not existent in the original theme, which is wrong because the theme will not show any additional comments than the number specified in the dashboard. Added “Related posts” code to single.php file. Styled it in style.css file. Added “Post tags” code and “Post Last Updated” code to single.php file. Styled them in style.css file. Added the paged menu to the header.php file and styled it in style.css file. The Diary theme did not natively support menus, now it does. Styled the post Author´s Comments differently from the rest of commenters. Added the code in style.css file. Fixed styling for the Resources custom page. Added the Site Map custom page. Styled it in style.css file. Added Stumble! custom page. Styled it in style.css file. Added all custom CSS styling that are post specific. Added all custom CSS styling that are page specifics. Changed the code for the <title> tag in the header.php file for better SEO purposes. The new title format takes care of the main index page, other pages, posts, categories, dates, searches etc. Fixed styling for the CALENDAR sidebar widget. The CALENDAR widget now looks much nicer than the original. Added the “Tag Cloud” code in functions.php file. Styled it in style.css file. Designed (in Photoshop) and added Buttons (StumbleUpon, Email and Donate) to the Sidebar (sidebar.php file). Added “favicon” to the header.php file. Added “Flush the buffer” code to the header.php file. This is a good first-step alternative to a caching plugin. Tested all posts and pages one by one, for proper layout and style and for user-friendly features (spacing, clarity etc.) and fixed accordingly. Validated code (CSS, HTML and Accessibility) and fixed as much as I can. Some errors are beyond my control like code for external services, obsolete HTML5/CSS3 tags from older posts, and browser specific CSS properties. The Diary theme is an HTML5/CSS3 theme while the other 3 themes are XHTML 1.0 Transitional/CSS2.1 which is causing the majority of the validation errors and warnings. Added Meta tags to the header.php file. Added an Error message for Internet Explorer version 6 and older. Added code to the Sidebar (sidebar.php), since it is less intrusive there. Added a Warning message for Internet Explorer version 7. Added code to the Sidebar (sidebar.php), since it is less intrusive there. Tested the Diary theme on older versions of Internet Explorer (IE6, IE7 and IE8) and fixed/updated CSS accordingly and added CSS hacks in header.php file. Added a “Page Not Found” custom page (404.php) as opposed to the default. Added code to track and display Single Posts number of Views. Tested for Website speed. Tables are listed below. Keep in mind that I am not using any caching plugins, since the Theme Switching will not work. I did NOT test the Theme on Mobile devices or on a Mac computer. For the sake of testing, I was curious to know the difference of page Load speed and performance between the 4 themes for this blog. Faster is better, because faster Websites make for a better user experience. Google Page Speed Online analyzes the content of a Web page, then generates suggestions to make that page faster. Reducing page load times can reduce bounce rates and increase conversion rates. From the 3 tables above, it is clear that the Diary theme is consistently slower to load compared to the other 3 themes. As a matter of fact, more improvement can be made to reducing page load times to all themes. Also for this blog, I am not using a caching plugin, since a caching plugin interferes with theme switching. However; I did implement 12 of the 14 Tips for Maximum WordPress Performance & Speed. What do you think about the New Diary theme? Do you have any feedback or suggestions for improvements? Is there anything that needs fixing? Do you like the idea that I gave you the choice to switch between themes for this blog? If you have something to add or anything else to say, please share your opinion in the comments section. Your opinion matters, unless it is a Spam. HTTP Compression. Does it Make a Difference for Website Speed? Thank you for this great blog. I just installed this Diary theme and after taking a closely look it was definitely missing a lot things that your post addresses. Great work on adding the menu bar, increasing the size of the background! Any chance you would be willing to provide me with your stylesheet for my own personal website? I just can’t figure out how to get the menu bar. Its a big ask from all the work you have done but I thought I ask anyways. with all the code you need. Also pay attention to Number 12 of the list (comment pagination code, this is nonexistent in their code. Meaning all your comments will not display if you choose to Break comments into pages). Thanks mate! Will check all the pages out! Boutros I want you to ask something about wordpress themes. Do you really believe that some themes are better SEO optimized than others in order to play a role at seo? The most possible answer is “the difference about SEO themes is so minimum that seo doesn’t worth to be the first option when choosing a theme.The first option must be design and navigation.” Right? It all depends about SEO that you are going to do at your blog. Right? First Check this SEO basics doc from Google. ….SEO doesn’t worth to be the first option when choosing a theme. The first option must be design and navigation.” Right? Right. and I will also add page loading speed. What good does a design and navigation do for you, if the page takes long time to load. As a rule of thumb the fastest the page load time the better, but the target should be less than 2-3 sec. Every Blog has to be optimized for Search Engines. 55 queries in 0.571 seconds.